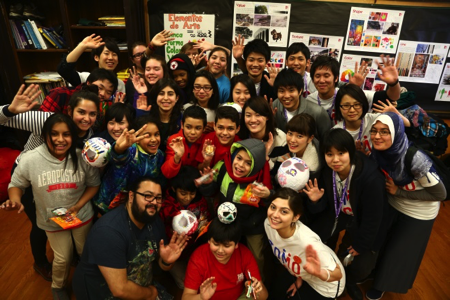 Students from DePaul University and Ritsumeikan University engaging in community service at Telpochcalli Chicago Public School, a leading arts-integrated and dual-language public primary school. During 2014–15, DePaul University (Chicago), the largest Catholic university in the United States and Ritsumeikan University (Kyoto), one of the first Japanese universities to promote international learning engaged in an exchange dedicated to the legacy of the life of the late U.S. Senator Daniel K. Inouye, an American of Japanese ancestry, public servant and political leader. Students from each institution traveled to the other for intensive visits focused on community engagement, public service, and building bridges of friendship between Japan and the United States. These exchange visits were carefully planned and framed to maximize experiential learning, to link DePaul and Ritsumeikan students, to take them out into the communities surrounding the universities, and to guide them in reflection and analysis of what they had learned. As discussed in Coping with New Disciplines, New Students, New Needs international learning is now equal parts core knowledge & concepts and personal growth & application. It asks for learning that occurs both within and beyond the classroom. Especially in terms of the latter, it asks for various forms of experiential learning. 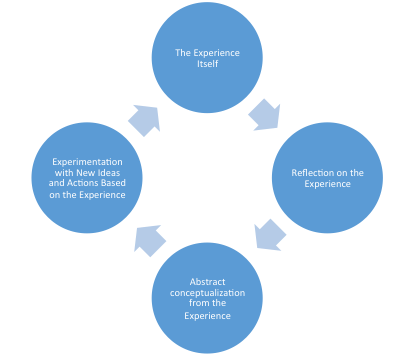 Experiential learning is enhanced by repeating this cycle again and again, deepening student reflection, skills, and knowledge over time. Experiential learning also benefits from a systematic process of reporting, guidance, and feedback, enabling students to articulate, refine, and capture what they are learning. There are many ways to provide such guidance. Experiential learning programs that convey academic credit generally embed such activities in more formal course structures. Non-credit programs find other ways to guide student learning: regular and required debriefing sessions, reflective reports shared with the group as a whole, presentations to the host organization or the home university upon the student’s return, daily journals to which instructors respond, and so forth. Whatever methods are used, students learn the most when they are guided through the processes of reflection, conceptualization, and experimentation. These categories overlap, and a single activity could fit all four at once. Service learning focuses on joining organizations in pursuing community-defined goals and issues. It sometimes occurs in a work context, sometimes not. Internships are a very special category, and they always occur in a work context. Whatever form they take, experiential learning programs invoke what Rebecca Hovey and Adam Weinberg call “partnered inquiry” – the pursuit of international learning through intentional engagement and collaborative knowledge-building with local partners (institutions, individuals, communities, and organizations). These are activities that understand experience and dialogue as powerful forms of learning. Developing such opportunities for U.S. and Japanese students is greatly helped when their home institutions have partners in the other country. Such partners offer well-established connections to the surrounding community, its businesses, organizations, and neighborhoods. They can also provide the cultural framing and bi-national dialogue necessary for students to navigate the differences in organizational structures, work schedules, and community issues they will encounter. Students themselves increasingly recognize the value of experiential learning while abroad. As tracked by the Institute for International Education, for-credit service projects and internships have doubled for U.S. students overseas over the last ten years. And as discussed Factors That Keep Japanese Students from Venturing Overseas, the wish to develop skills relevant to global careers is one of the primary motivations for study abroad expressed by Japanese students. 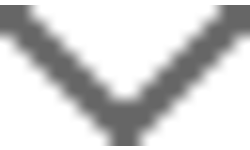 A number of U.S.-Japanese partnerships have responded by developing such programs. An exemplary case is the one featured on this page between DePaul University and Ritsumeikan University.